On this podcast recorded at Fodoable.io in Seattle, our host Yareli Quintana speaks with three leaders in the foodservice and beverage industry who also happen to be women. The conversation begins by each identifying some of the changes they’ve seen happen in their respected industries throughout the years. First, you’ll hear from Zoi Antonitsas, executive chef of Little Fish, Seattle’s first modern-day craft cannery and restaurant which will be found in the heart of Pike Place Market once it opens. Chef Antonitsas has over 20 years of experience in the restaurant industry and says she’s been fortunate to have worked with incredible men and women up and down the West Coast. Then, you’ll hear from Brenda Lobbato, the Northwest Region Vice President at Ste. Michelle Wine Estates. She got into the beverage industry 30 years ago and has been in her current role since 2016, where she manages 26 percent of Ste. Michelle Wine Estates’ revenue totaling to $698M. Lobbato shares with the speakers that she’s recently seeing a lot more women getting into the beverage industry, which, for a long time, has been a “good ol’ boys network.” She’s proud to share that she’s helping spearhead a women’s group within Ste. Michelle Wine Estates. Throughout the podcast, you’ll also hear from Roz Edison, co-founder of Marination Ma Kai, a food truck turned into brick-and-mortar locations serving up Hawaiian-Korean fusion cuisine across Seattle. Ten years ago, Marination Ma Kai’s food truck was “the first on 10 rolling in the streets of Seattle.” That number has grown tremendously since then and now Edison and her business partner are also established entrepreneurs in the fast casual space. The four speakers later dive into topics like employee relations, mentorship, and hopes for the future of the industry as it pertains to women. Stay tuned to hear which direction this interesting conversation took and how each panelist feels about each topic discussed! On this episode of On Foodable, we are featuring Chef Will Gordon, former Executive Chef of Westward, a Seattle restaurant located directly on the north shores of Lake Union. Chef Gordon will be working with wild Alaska pollock, provided by Trident Seafoods, to make a delicious Matbucha Braised Wild Alaska Pollock dish. This is the last episode out of our four-part series of chef demos that were filmed at our Foodable.io Seattle event, sponsored by the Alaska Seafood Marketing Institute. Wild Alaska Pollock is an underutilized, sustainable fish species. This recipe serves 6 people. Preheat your oven to 400 degrees. Heat up matbucha in two saute pans its oven proof handles (thin with a little bit of vegetable stock, water or tomato juice to the consistency of tomato sauce). When it is at a nice simmer, nestle in three portions of fish per pan, leaving space between each piece. Move to oven and bake for about 5 minutes, or until the fish is just done and flaky. While the fish is in the oven, blister the shishito peppers in a hot, dry pan until black spots occur, and they are just cooked. Remove to a plate on the side. After you remove the pans of fish from the oven, gently remove all of your fish to a plate off to the side. Put the matbucha back on the stove and reduce down if it needs it. Add a little olive oil, salt or lemon as necessary to make it taste as you like. To serve, spoon some matbucha on each plate, nestle a few shishitos in the matbucha as well as your fish. Garnish with dollops of the preserved lemon cream and herbs that have been lightly dressed in extra virgin olive oil and salt. To hear Will Gordon’s thoughts about what the role of a chef is today and to replicate his delicious sustainable fish dish, follow along by watching the episode above! 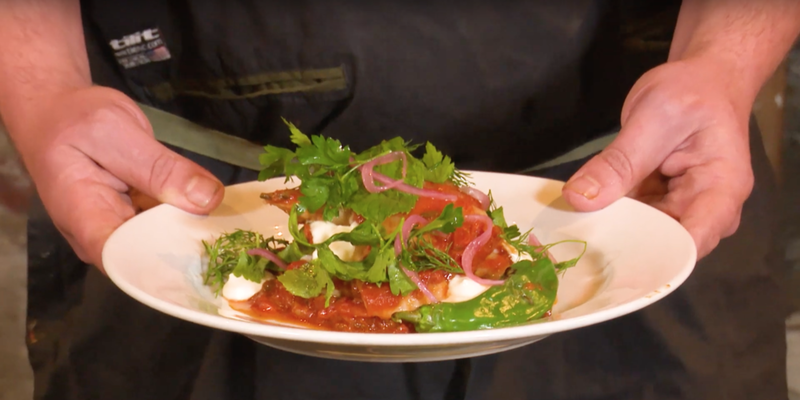 On this episode of On Foodable, we are featuring Chef David Glass, from Ethan Stowell Restaurants’ Staple and Fancy Mercantile located in the Seattle neighborhood of Ballard. Chef Glass will be working with wild Alaska pollock, provided by Trident Seafoods, to make a beautiful Lemon and Thyme Stuffed Wild Alaska Pollock dish. This is the third episode out of our four-part series of chef demos that were filmed at our Foodable.io Seattle event, sponsored by the Alaska Seafood Marketing Institute. Take the two skin-on fillets and lay slices of lemon and thyme in between. Tie the fish with butcher’s twine to secure the two filets together. Sear the cauliflower in the olive oil. Add the capers and butter. Allow butter to brown and add the lemon juice to stop the browning process. Grill the fish on both sides (about 4 minutes per side). Plate the fish, snipping and carefully removing the twine, and top with cauliflower, caper and butter mix. Top with crispy parsley and sage. At Staple and Fancy there’s a focus on seafood and utilizing the abundance of quality local resources that are available to chefs in the city of Seattle. For Chef Glass, sustainability is a personal responsibility. To replicate this delicious sustainable dish follow along by watching the episode above! Some say Aloha means to live in harmony with the natural world and each other, this is the test of our time. Kona Brewing Company is more than just another craft beer company. With a focus on smarter energy, responsible practices, and a dedication to the community around them Kona is embodying the true meaning of Aloha. On this episode of On Foodable filmed at Foodable.io Seattle sponsored by Alaska Seafood Marketing Institute, we get to learn a little more about Kona Brewing Company from Parker Penley, Lead Innovation Brewer at Craft Brew Alliance. With this mentality and respect towards the Hawaiian Islands, Kona Brewing Company has established sustainability as one of its primary pillars. From building a state of the art brewery powered by solar panels to investing in a new High-Efficiency Brewing System to use less grain and barley, this company is taking sustainability to the next level. However, Aloha doesn’t stop there at Kona Brewing Company. Besides having a focus on sustainability, their passion and desire fosters not only a high-quality beer but always creates an experience. Aloha is all about the connection people have to the land and the way they connect with others on the island. Kona Brewing Company embodies that, by connecting local ingredients used to create their product, connecting with the community, and relaying the spirit of Hawaii and paradise to their consumers. Watch the episode above to learn more about Kona and its sustainability efforts and the challenges faced in doing so on the island. Looking for more beer and wine brands that are putting sustainability first? We recently interviewed Rob Bigelow, Senior Director of Wine Education and On Premise Development at Ste. Michelle Wine Estates, about Villa Maria Wine Estate—a company in partnership with Ste. Michelle Wine Estates.